Salah Jadid (1926 – 19 August 1993, Arabic: صلاح جديد‎) was a Syrian general and ultra-left-wing political figure in the Arab Socialist Ba'ath Party in Syria, and the country's de facto leader from 1966 until 1970, when he was ousted by Hafez al-Assad's Corrective Movement. Jadid was born in 1926 in the village of Dweir Baabda, near the coastal city of Jableh, to an Alawite family of the Haddadin tribe. However, there is another report stating his birth year as 1924. He studied at the Homs Military Academy, and entered the Syrian Army in 1946. Jadid was originally a member of the Syrian Social Nationalist Party (SSNP), but later became a member of the Arab Socialist Ba'ath Party, led by Michel Aflaq and Salah al-Din al-Bitar, in the 1950s through an associate of Akram al-Hawrani. Even so, Jadid remained close to the SSNP; his brother, Ghassan, was one of its most prominent members in Syria. He changed allegiance again in the 1950s, when he became a member of the Arab Nationalist Movement, a party supporting Gamal Abdel Nasser's ideological beliefs. Jadid supported Syria's ascension into the United Arab Republic (UAR), a union republic consisting of Egypt and Syria. During the UAR-era, Jadid was stationed in Cairo, Egypt. Jadid established the Military Committee alongside other Ba'athists in 1959. The chief aim of the Military Committee was to protect the UAR's existence. In the beginning there was only four members of the Military Committee, the others were Hafez al-Assad, Abd al-Karim al-Jundi and Muhammad Umran. The Military Committee also tried to save the Syrian Ba'ath movement from annihilation. Committee members were among those who blamed Aflaq for the Ba'ath Party's failing during the UAR years. The party's Third National Congress in 1959 supported Aflaq's decision to dissolve the party, but a 1960 National Congress, in which Jadid was a delegate representing the then-unknown Military Committee, reversed the decision and called for the Ba'ath Party's reestablishment. The Congress also decided to improve relations with Nasser by democratising the UAR from within. A faction within the party, led by al-Hawrani, called for Syria's secession. The Military Committee did not succeed in its aims, and in September 1961 the UAR was dissolved. Nazim al-Qudsi, who led the first post-UAR government, persecuted Jadid and the others for their Nasserite loyalties, and all of them were forced to retire from the Syrian Army. While Jadid remained away from public view, as the second secretary of the Ba'ath Party, men allied to him filled the top posts in state and army: Nureddin al-Atassi, as party chairman, state president and later prime minister; Yousuf Zouayyen, as prime minister; Brahim Makhous as foreign minister, Hafez al-Assad as defense minister; Abd al-Karim al-Jundi, as security chief. Many of these men were Alawis (e.g. all of the above except Atassi, Jundi, and Zouayyen, who were Sunni), giving the government a sectarian character. Several were military men, and all belonged on the Ba'ath Party's left wing. Under Jadid's rule, Syria aligned itself with the Soviet bloc and pursued hardline policies towards Israel and "reactionary" Arab states especially Saudi Arabia, calling for the mobilization of a "people's war" against Zionism rather than inter-Arab military alliances. Domestically, Jadid attempted a socialist transformation of Syrian society at a forced pace, creating unrest and economic difficulties. Opponents of the government were harshly suppressed, while the Ba'ath Party replaced parliament as law-making body and other parties were banned. Public support for his government, such as it was, declined sharply following Syria's defeat in the 1967 Six-Day War, when Israel captured the Golan Heights, and as a result of the troubled internal conditions of the country. After the war, in particular, tensions began to increase between Jadid's followers and those who argued that the situation called for a more moderate stance on socialism and international relations. This group coalesced around Defense Minister Hafez al-Assad, who protested the "adventurism" of Jadid, and demanded a normalization of the internal situation by adopting a permanent constitution, liberalizing the economy, and mending ties with non-Ba'athist groups, as well as the external situation, by seeking an alliance with conservative Arab states such as Jordan and Saudi Arabia. While Jadid retained the allegiance of most of the civilian Ba'ath apparatus, Assad as defense minister gradually asserted control over the military wing of the party. In 1969, Assad purged several Jadid loyalists, and from that point on Jadid had lost his preeminence in the state. In 1970, when conflict erupted between the Palestine Liberation Organization (PLO) and the Jordanian army, Jadid sent Syrian-controlled Palestinian troops of the nominally PLO-run Palestine Liberation Army, based in Syria, into Jordan in order to help the PLO. This action was not supported by Assad's more pragmatic Ba'ath faction, and the troops withdrew. The action helped trigger the simmering conflict between Jadid's and Assad's wings of the Ba'ath Party and army. The Syrian communist party aligned itself with Salah Jadid. The Soviet ambassador, Nuritdin Mukhitdinov was drawn in the power struggle. Hafez al Assad was angered by the meddling in Syrian politics by the Soviet Union, so he decided to scare the Soviets by sending Mustafa Tlass to Beijing to procure arms and wave Chairman Mao's little Red Book. In November 1970, Jadid attempted to fire Assad and his supporter Mustafa Tlass, which in turn caused Assad to launch an intra-party coup against Jadid, dubbed the Corrective Movement. 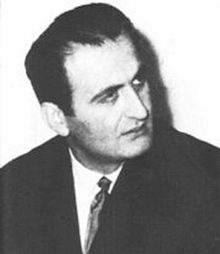 Jadid was arrested on 13 November 1970, and remained in the Mezzeh prison in Damascus until his death, while al-Assad would remain in power until his death in 2000. Jadid died of a heart attack in a hospital on 19 August 1993. ^ a b Seale 1990, p. 63. ^ Tucker & Roberts 2008, p. 535. ^ a b Bulloch, John (23 August 1993). "Obituary: Salah Jadid". The Independent. Retrieved 7 April 2013. ^ Moubayed 2006, pp. 259–260. ^ a b c Moubayed 2006, p. 260. ^ "Salah Jadid, 63, Leader of Syria Deposed and Imprisoned by Assad". The New York Times. 24 August 1993. Retrieved 7 April 2013. Wikimedia Commons has media related to Salah Jadid. Tucker, Spencer; Roberts, Priscilla Mary (2008). The encyclopedia of the Arab–Israeli conflict: a Political, Social, and Military History: A–F. 1. ABC-CLIO. ISBN 978-1-85109-841-5.